I asked my friend if she would consider tostadas to be in the Taco “family”, so that I could post this as a Taco Tuesday post…but sadly she told me, “too bad, so sad – they are in no way a taco.” Well, dammit. I tried y’all. It’s been far too long since a Taco Tuesday post has graced this page. I’ll fix it soon, I promise! In the mean time, I do have one ah-may-zing, non-taco, recipe to share with you! Guess I’ll know better next time! And I was nice enough to tell you my mistake, so you won’t make the same one!! Crispy tostada shell, topped with layers of refried beans, chipotle chicken, creamy guacamole, cheese, lettuce and tomatoes…uh yeah. Make enough for leftovers!! In a medium bowl, combine the cubed chicken, chipotle chili powder, salt and pepper Toss well to coat. In a small saucepan over medium heat, add the refried beans, 1 tablespoon of oil, 1 tablespoon cumin and garlic powder. Stir until heated through. Taste and adjust seasonings as necessary. Meanwhile, cut the avocados in half, remove the pits and scoop them into a medium-sized bowl. Add the lime juice and garlic powder, a little at a time to reach your desired taste, and mash the mixture with a fork until fairly smooth and well-combined. Taste at this point and see if you want to add more lime juice and/or garlic powder. Season with salt and pepper, and set aside. 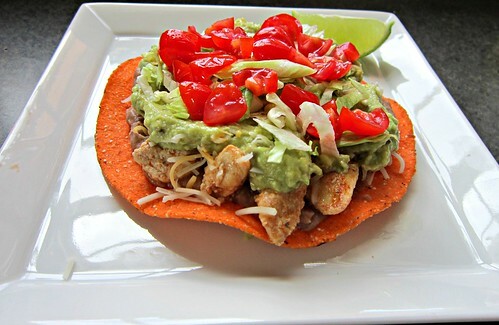 To assemble, spread a think layer of beans on each tostada and top with chicken, shredded cheese, guacamole, lettuce, tomato, fresh cilantro and green onions. Garnish with lime wedges and serve.